A few changes are going on around here. In our sitting area and entry way to be exact. 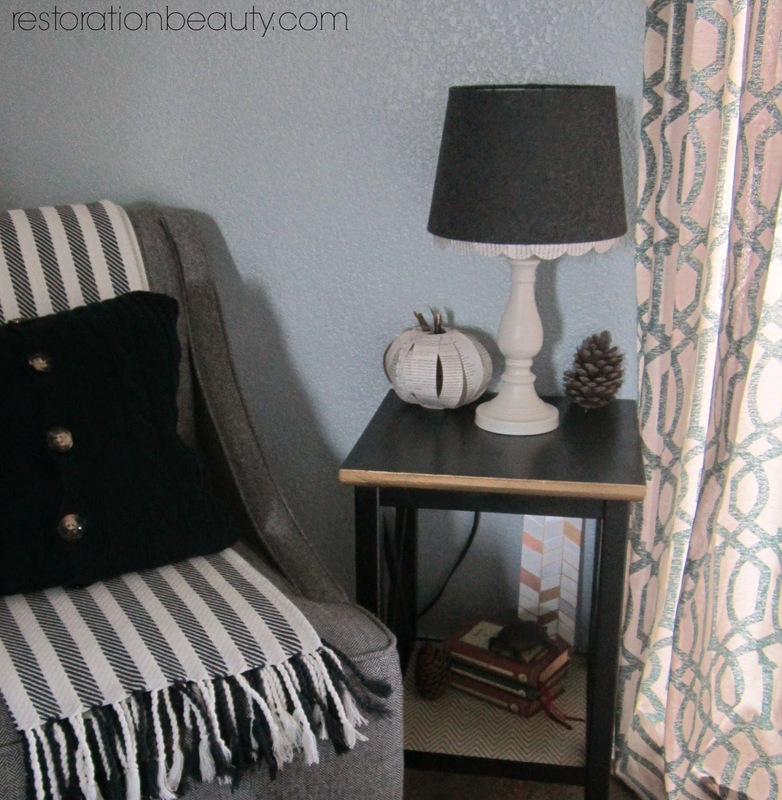 And although, I won't be sharing the changes in our entry way yet, I'm excited to show you my newest addition to our little sitting area: this REVAMPED LAMP USING SPRAY PAINT AND BOOK PAGES! That's right, people. Book pages. You know those things people normally read? Well, I've been busy tearing them up these days. It all started with my Book Page Wreath- and I can tell you this, it's not over. Maybe I should of started a Crafting With Book Pages series? Too late. The ball has officially been rolled. 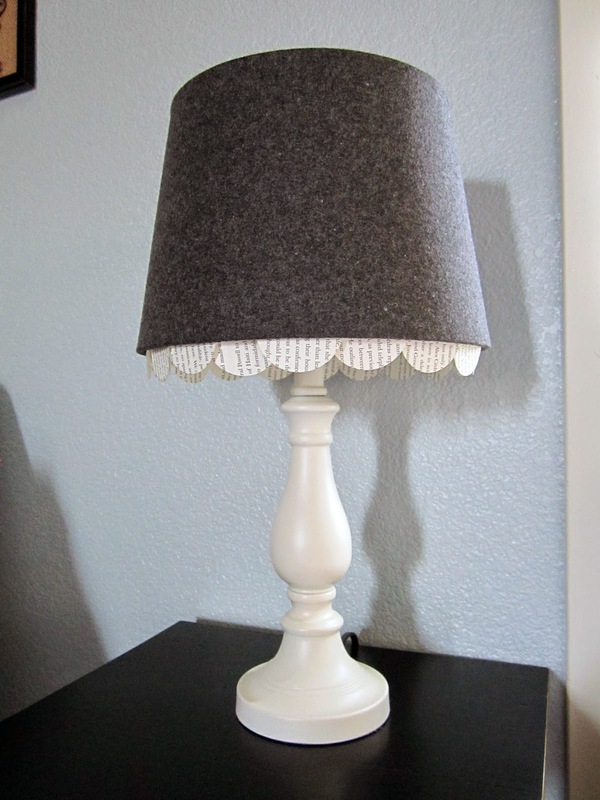 My favorite part about this LAMP MAKEOVER is the fact that it only cost me $4. This girl always has spray paint on hand so I only had to buy a book ($1 at the Dollar Tree) and a lampshade, which I found at Target for $3! 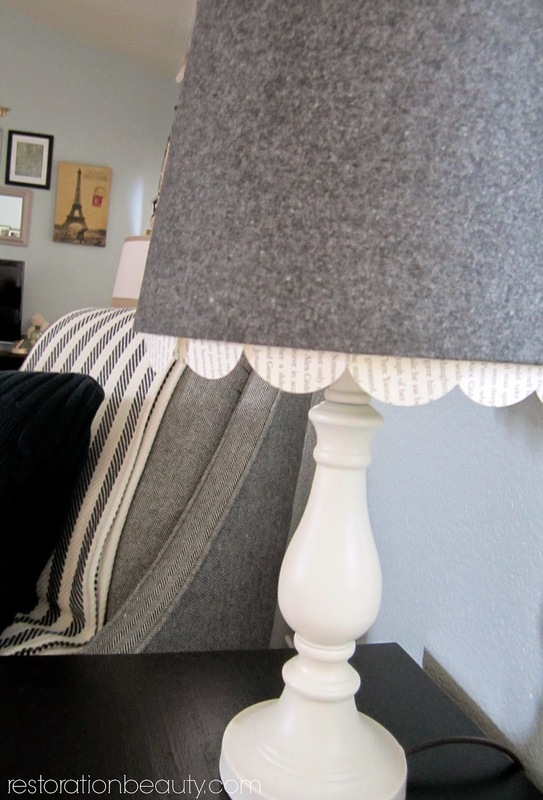 Adding the scalloped book page trim to the bottom of the lampshade was a last minute detail I'm so glad I thought of! When genius happens around here it's always in the form of fabulous! 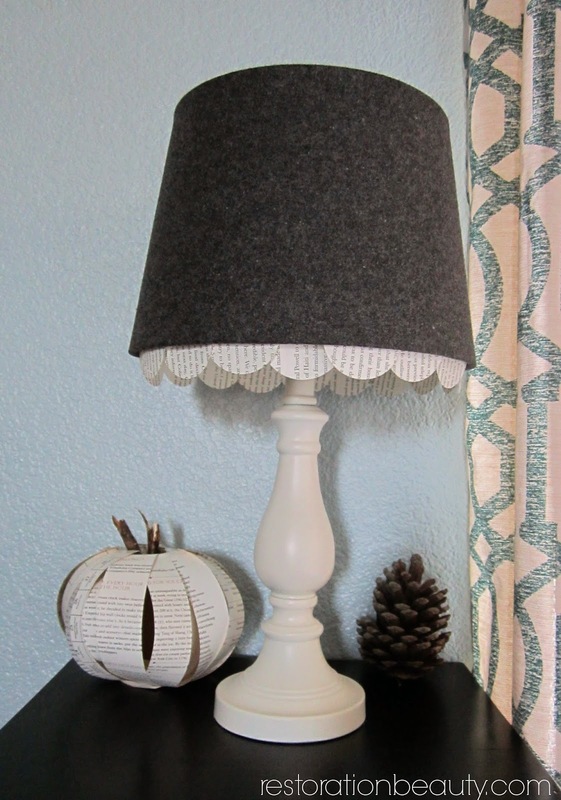 So how did I transform the once drab lamp base into this gorgeous feminine lamp? It was so easy. Easy, easy, easy! I'm sure you're familiar with those words around here. 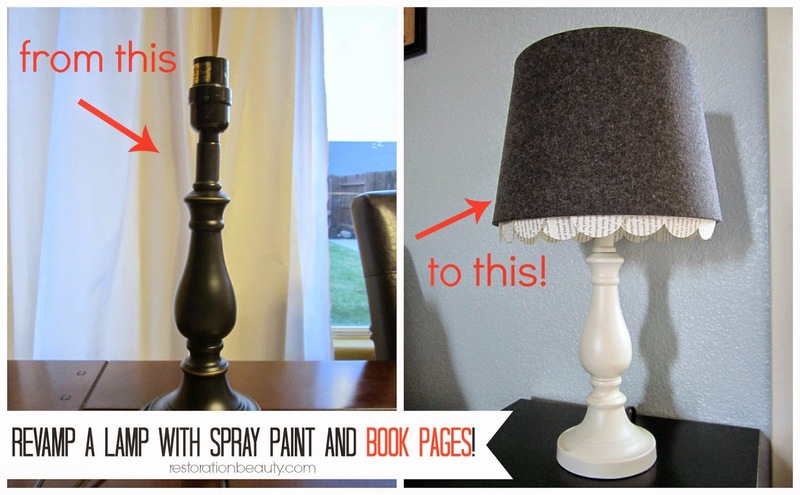 All I did was spray paint my lamp base with my favorite Heirloom White by Rustoleum , add the gorgeous shade I found at Target for $3 and then I added the book page trim. I created the book page trim by cutting book pages with my2 inch circle punch . Then I used good ol tape to tape each book page circle along the bottom inside of the lampshade rim! I decided to only show half of the circle to create a scalloped book page trim but you can show more or less of the book page circle. You could even have them dangle by using a very thin string! 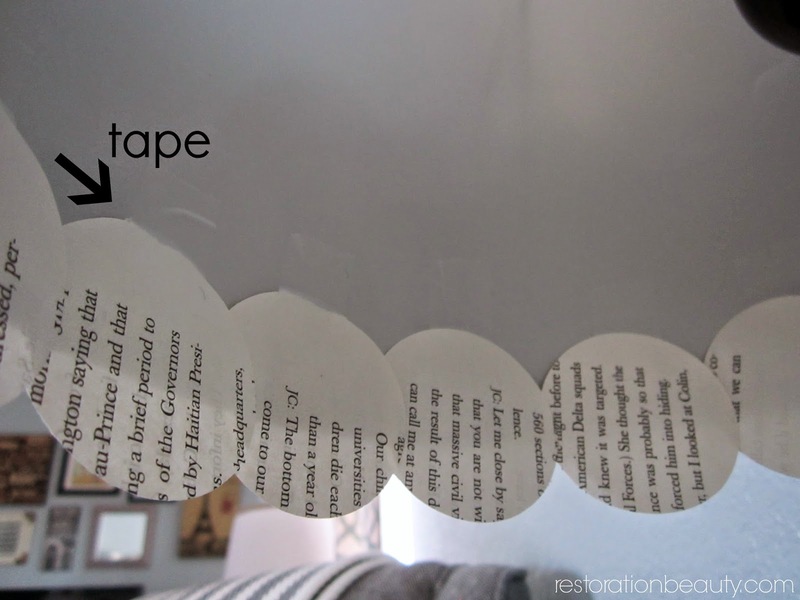 It's so convenient to be able to easily remove this book page trim and replace it with any craft paper! I also think it goes perfectly well with my little book page pumpkin that I shared with you all on Instagram! I got the book page pumpkin idea from Katie from View From The Fridge and I guess she's to blame for my newest book page crafting obsession! I love a good contrast and this lamp definitely contrasts nicely against my black table, something it wouldn't have done if I had not painted it white. 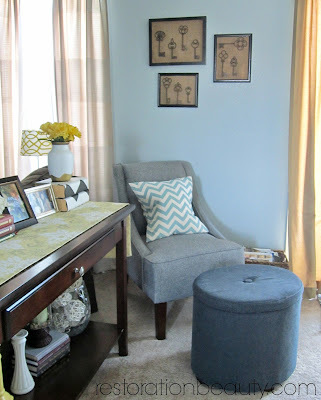 And the new lampshade just happens to go with my gray chair- also a steal from Target. And here's the newest addition to my little sitting area: the small Black & Gold Table that used to be in our entry way. It just makes so much more sense in this space than in the entry. And my "new" lamp completes it, don't you think? Not very complete. Kind of lonely and sad, actually. But I'm loving the space now! It's the perfect spot to sit and read in the morning and evening. Yes. I not only destroy books but read them too. It looks really nice!! 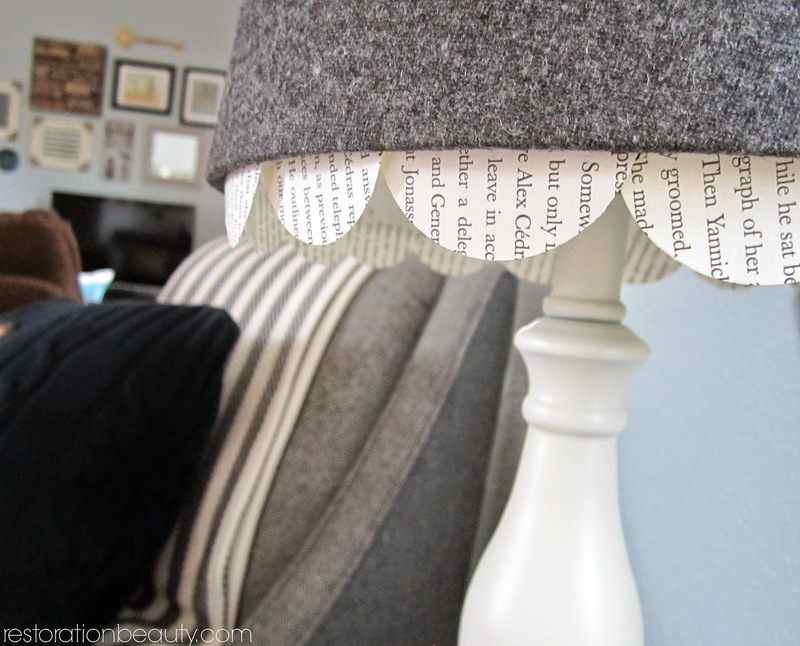 I like how you added the book page trim to the lampshade for an extra kick. Don't you love spray painting lamps? It's such a little change with a big impact. I painted mine for the same reason...they weren't showing up on my dark tables. Love the texture on the lampshade too! Thanks, Lisa!! I'm so glad I thought of adding the book page trim too!! It completes it nicely! And YES- spray painting rocks!! Thank you Galaxia! You're too sweet! Have fun revamping! !